SARRAH is a national, not-for-profit organisation, recognised as the peak body for Allied Health Professionals (AHPs) working in rural and remote Australia. The rural and remote allied health workforce is comprised of over 20 professions including: Audiology, Dietetics, Exercise Physiology, Occupational Therapy, Optometry, Oral Health, Pharmacy, Physiotherapy, Podiatry, Psychology, Social Work and Speech Pathology. They work across a number of sectors: the public sector, private practice, community health, family services, non-government organisations, universities, education, justice and welfare systems, as well as programs funded by the Australian Government. SARRAH was formed in 1995 out of the endeavours of a group of AHPs dotted around rural and remote Australia. This group shared concerns that the AHP workforce was inadequate to meet the needs of rural and/or remote communities. They were also concerned that policy debates and health reform agendas at the time were dominated by the issues of medical practitioners and access to GPs for Australians residing in the bush. This was unacceptable given that skilled services provided by AHPs are essential to improving quality of life and health outcomes for many rural and remote residents. As a solution it was felt that a national organisation should be established to represent this view and the issues of AHPs in relation to the needs of local communities. SARRAH was thus founded on the premise that every Australian should have access to equitable health services wherever they live and that allied health services are fundamental to Australian comprehensive primary health care and optimal patient/community wellbeing. SARRAH has always been about networking, bringing people together with common cause to try to improve health services for rural and remote Australians. SARRAH has given us an effective seat at the table so, as rural and remote AHPs, we are no longer ‘out of sight, out of mind. SARRAH has been very actively engaged at the political level. We’re now well known in Canberra by politicians of all political persuasions and by senior bureaucrats. The SARRAH conferences have been pivotal in bringing people together to share information, debrief, and empower one another to take chances and advocate. The rural allied health scholarships have been huge for SARRAH in terms of providing a valued program and for the SARRAH brand. The SARRAH web resource, Transition to Rural Practice, was noted as being a particularly useful tool for AHPs new to rural and/or remote health care roles. Two projects cited as being recipients of pivotal support from SARRAH have been the Indigenous Diabetic Foot project and the North-west Queensland Allied Health project. It is clear that SARRAH has played a valuable role over many years now to further the cause of improved access to allied health services for rural and remote Australians. 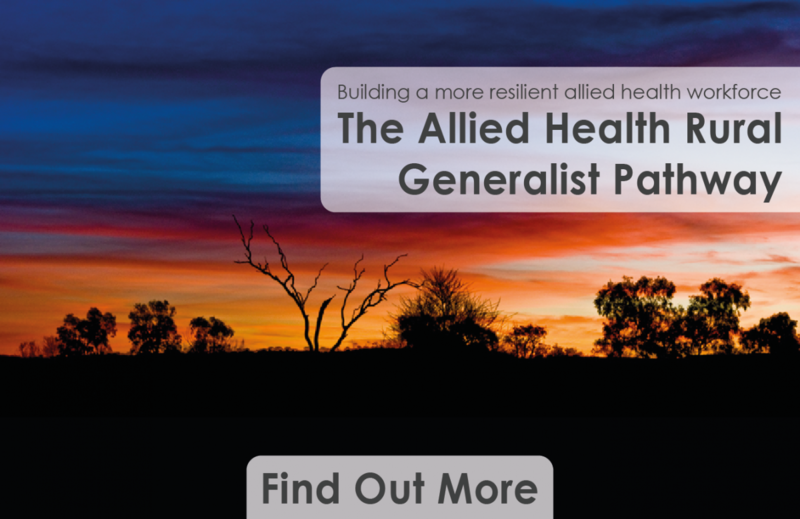 Important networks and forums have been established to give voice to the needs of rural and remote communities for allied health services, and a level of allied health leadership has been developed as a by-product. Yet key challenges persist and the need for an effective peak body for rural and remote allied health remains as vital as ever. SARRAH must now adapt its strategic approach in order to optimise its advocacy role in a new health environment. SARRAH must reinvigorate the membership and develop new partners and allies in the cause of equitable health care for people residing in the bush. If these things can be achieved in the coming period, the future looks bright for SARRAH and a better deal on health care for rural and remote Australians.